Adut from near Santa Rosa, Sonoma County, pretty far north in their range. constricted at the base Some Ensatina, like this one, are found with a missing tail. 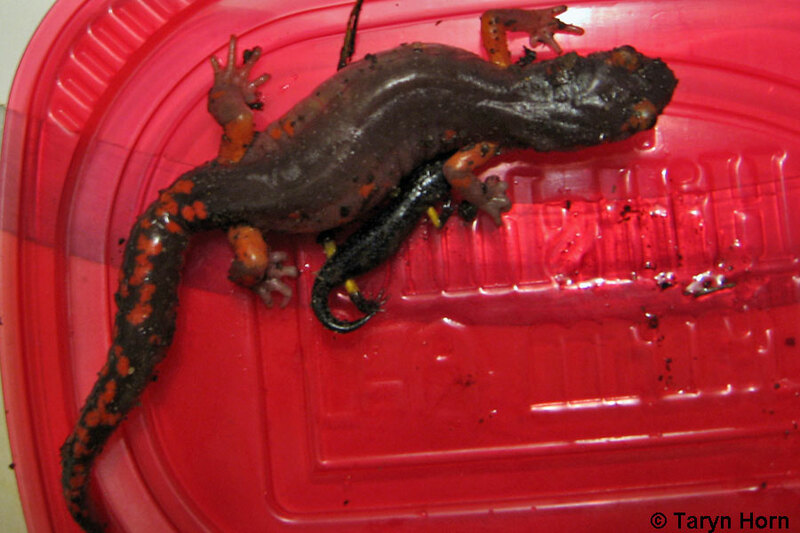 The tail is easily broken off, and sometimes it will be released by the salamander to distract a predator, but it will grow back. This adult and juvenile were found near Twain Harte in Tuolumne County, which is in the contact or hybrid zone between E. e. xanthoptica and E. e. platensis. © Taryn Horn Adult from the intergrade zone with E. e. eschscholtzii - Monterey Ensatina, coastal Santa Cruz County. Merced County Habitat, San Mateo County A careful look underneath the fallen branches and bark of the dead tree shown above on a wet winter afternoon turned up 16 salamanders of 4 species - one Arboreal Salamander, two Coast Range Newts, one Yellow-eyed Ensatina, and 12 California Slender Salamanders, proving that wood debris on a forest floor is an important microhabitat for salamanders. Along with fallen debris, tree bark, tree cavities, root holes, and splits in trees are also useful habitat for many kinds of wildlife, including birds, mammals, amphibians and reptiles, but dead trees and their debris are often removed indiscriminately without consideration for wildlife. The Cavity Conservation Initiative is a group whose goal is to educate land managers and the public about the value of dead trees. 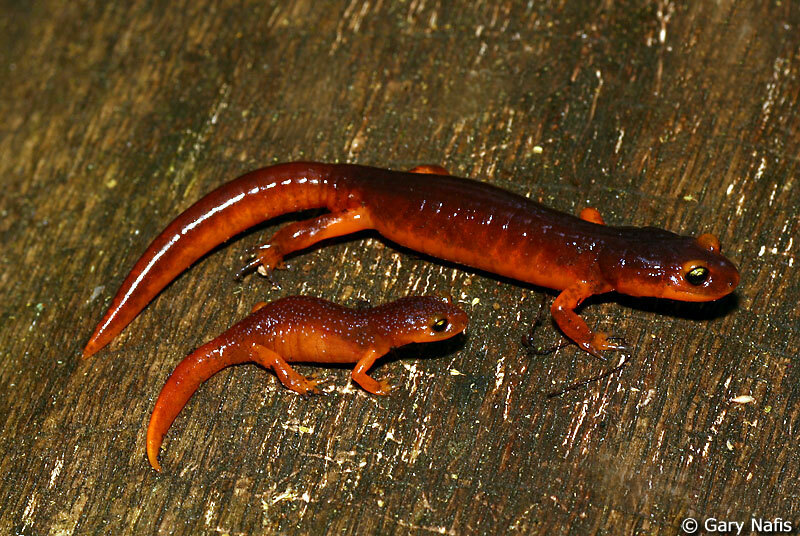 Views of two Yellow-eyed Ensatina, the first from Contra Costa County, the second from the Santa Cruz Mountains. 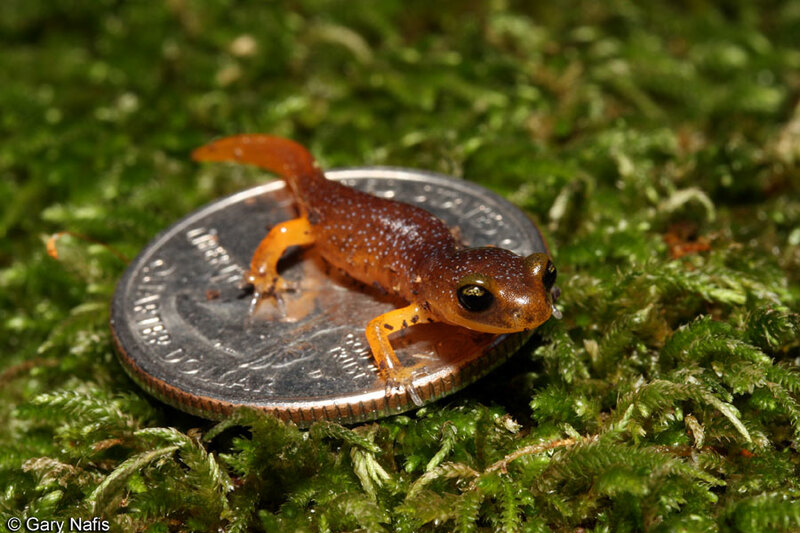 Adult Ensatina measure from 1.5 - 3.2 inches long (3.8 - 8.1 cm) from snout to vent, and 3 - 6 inches (7.5 - 15.5 cm) in total length. The legs are long, and the body is relatively short, with 12 - 13 costal grooves. 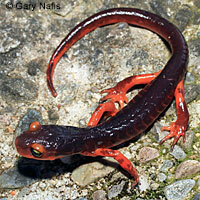 The tail is rounded and constricted at the base, which will differentiate this salamander from its neighbors. 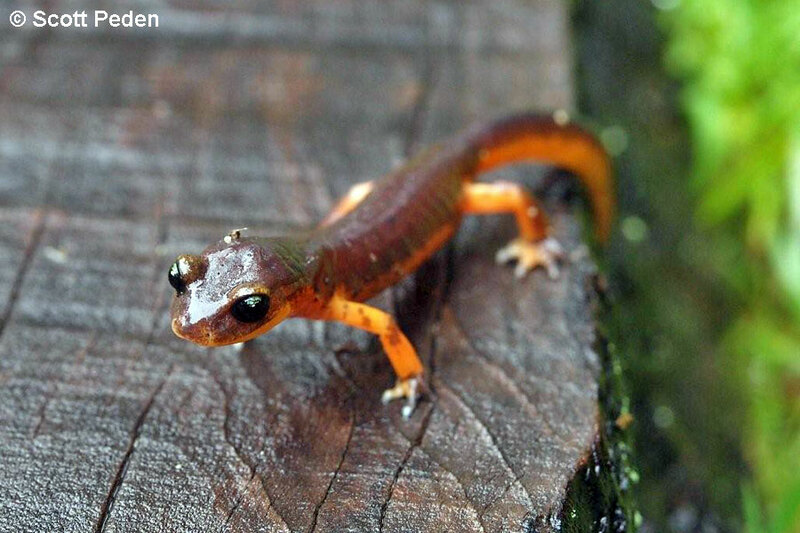 A bright yellow patch on the eye gives this salamander its common name. This subspecies is orange-brown to dark brown above, with orange coloring below, on the eyelids, and on the sides of the head, tail and body. Yellow to orange coloring is present on the base of the limbs. Young are dark above, with yellow or orange coloring on the base of the limbs. Males have longer, more slender tails than females, and a shorter snout with an enlarged upper lip, while the bodies of females are usually shorter and fatter than the bodies of males. 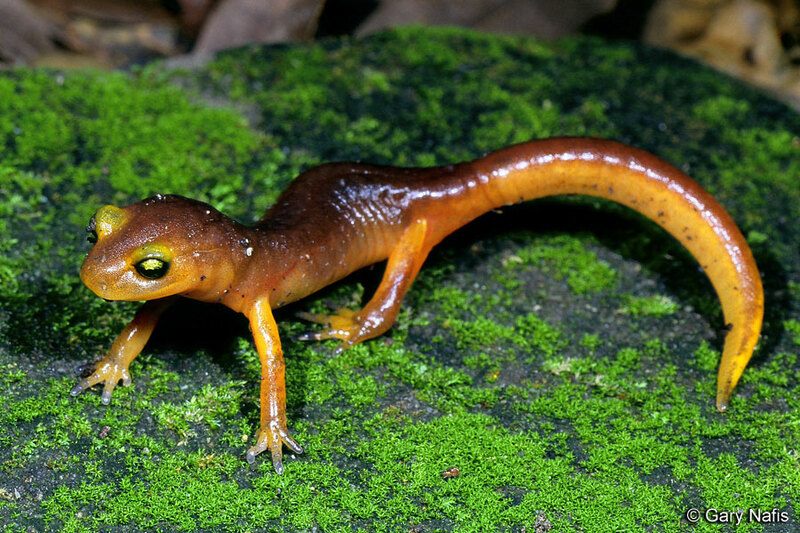 Ensatina live in relatively cool moist places on land becoming most active on rainy or wet nights when temperatures are moderate. They stay underground during hot and dry periods where they are able to tolerate considerable dehydration. They may also continue to feed underground during the summer months. High-altitude populations are also inactive during severe winter cold. Adults have been observed marking and defending territories outside of the breeding season. Longevity has been estimated at up to 15 years. and raccoons (Procyon lotor; Wake et al., 1989). ..."
Ensatinas eat a wide variety of invertebrates, including worms, ants, beetles, spiders, scorpions, centipedes, millipedes, sow bugs, and snails. They expell a relatively long sticky tongue from the mouth to capture the prey and pull it back into the mouth where it is crushed and killed, then swallowed. Typically feeding is done using sit-and-wait ambush tactics, but sometimes Ensatinas will slowly stalk their prey. 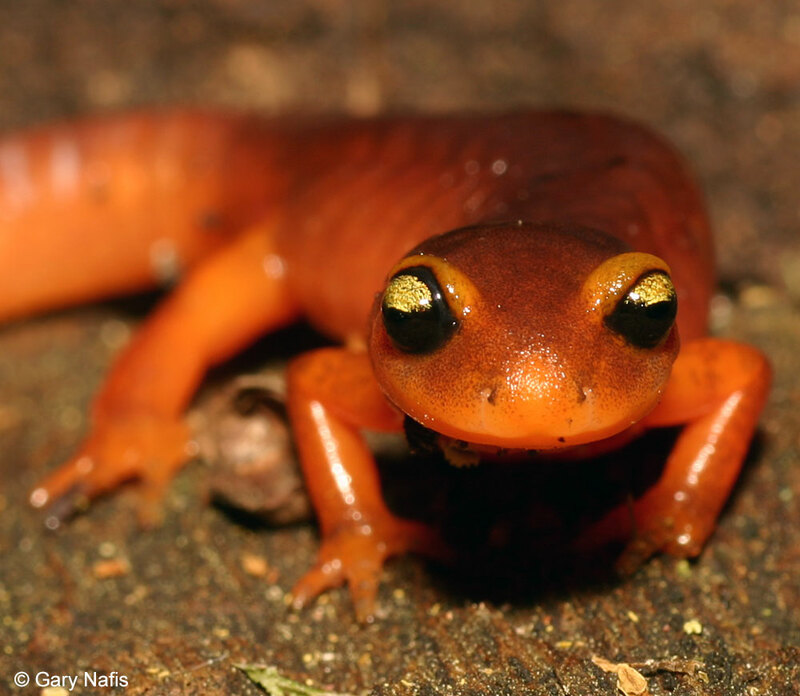 Rarely, Ensatina make a hissing sound, similar to the hissing of a snake, when threatened. Breeding takes place in Fall and Spring, but may also occur throughout the winter. 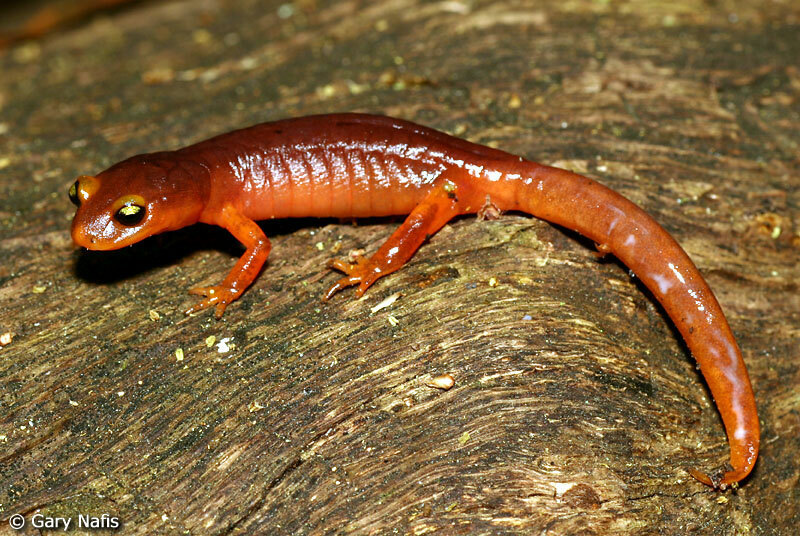 Stebbins describes an elaborate Ensatina courtship involving the male rubbing his body and head against the female eventually dropping a sperm capsule onto the ground which the female picks up with her cloaca. A description and illustration of this courtship can be seen here. You can also watch an Ensatina courtship video on YouTube. The female can store the sperm until she determines the time is right to fertilize her eggs. At the end of the rainy season, typically April or May, females retreat to their aestivation site under bark, in rotting logs, or in underground animal burrows, and lay their eggs. Females lay 3 - 25 eggs, with 9 - 16 being average. In labs, eggs have hatched in 113 - 177 days. Young develop completely in the egg and probably leave the nesting site with the first saturating Fall rains, or, at higher elevations, after the snow melts. 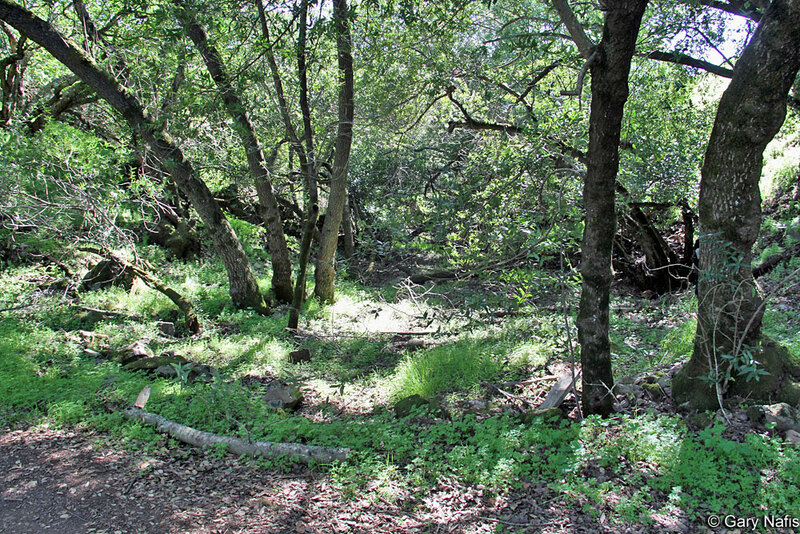 Inhabits moist shaded evergreen and deciduous forests and oak woodlands, mixed grassland, and chaparral. Found under rocks, logs, other debris, especially bark that has peeled off and fallen beside logs and trees. 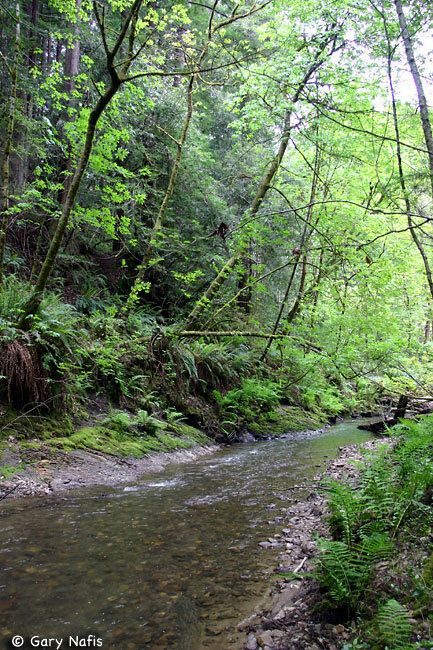 Most common where there is a lot of coarse woody debris on the forest foor. In dry or very cold weather, stays inside moist logs, animal burrows, under roots, woodrat nests, under rocks. 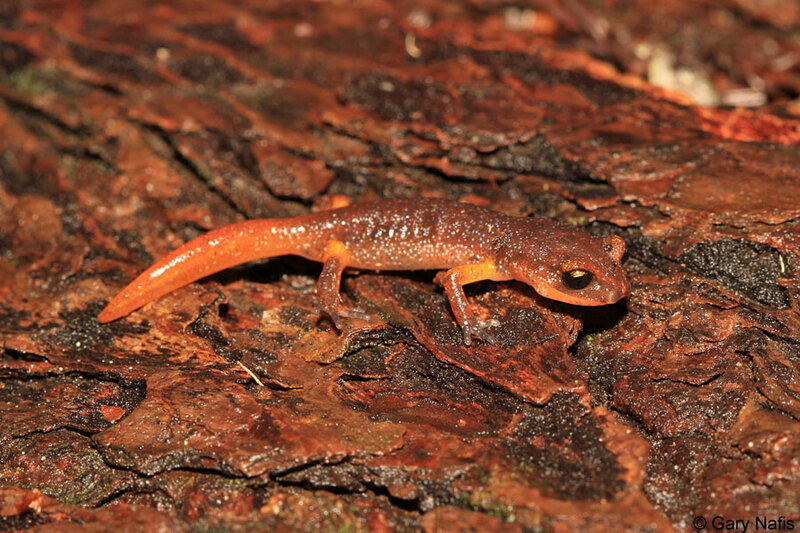 This subspecies, Ensatina eschscholtzii xanthoptica - Yellow-eyed Ensatina, is endemic to California, ranging from from near Healdsburg in Sonoma County, south along the east side of the San Francisco Bay to Santa Cruz County. 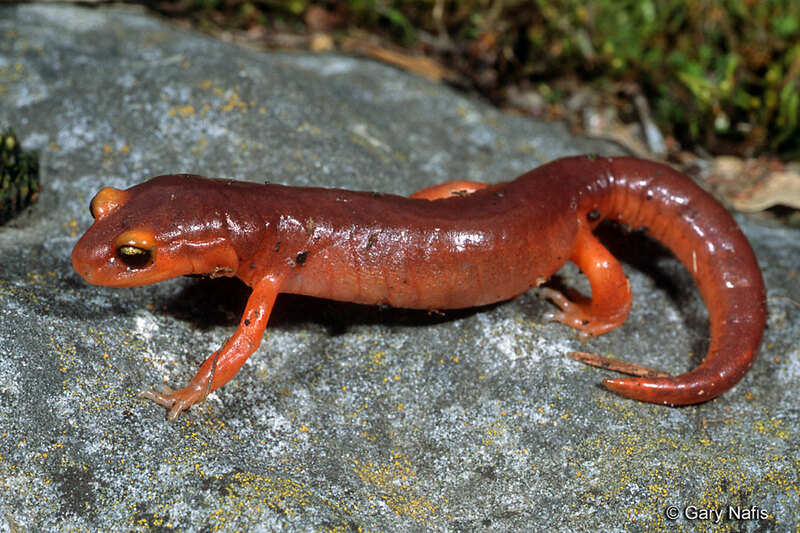 (See comments under "Taxonomic Notes" below for the SF Peninsula Ensatina population.) A separate population occurs in the foothills of the central Sierra Nevada mountains. 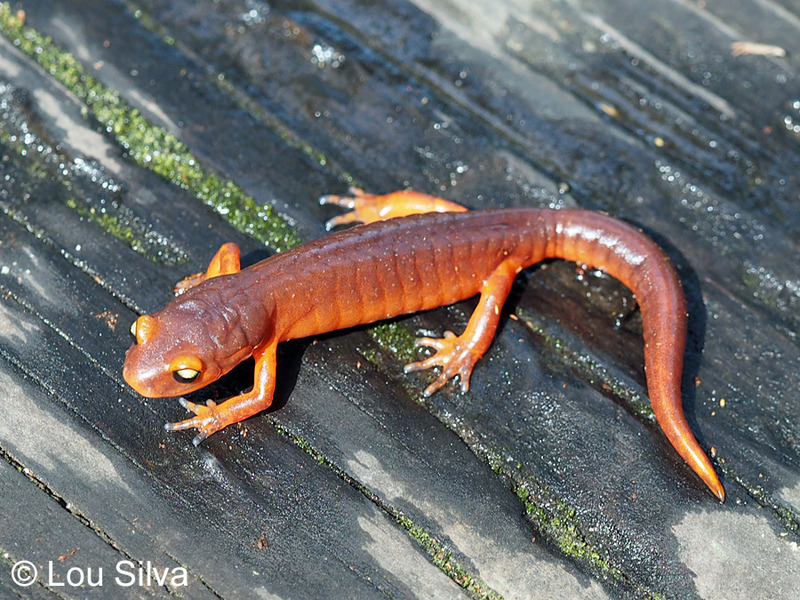 Yellow-eyed Ensatina were probably distributed from the Bay Area across the central valley when the climate there was cooler and moister, but as it became drier, two separate populations were formed. 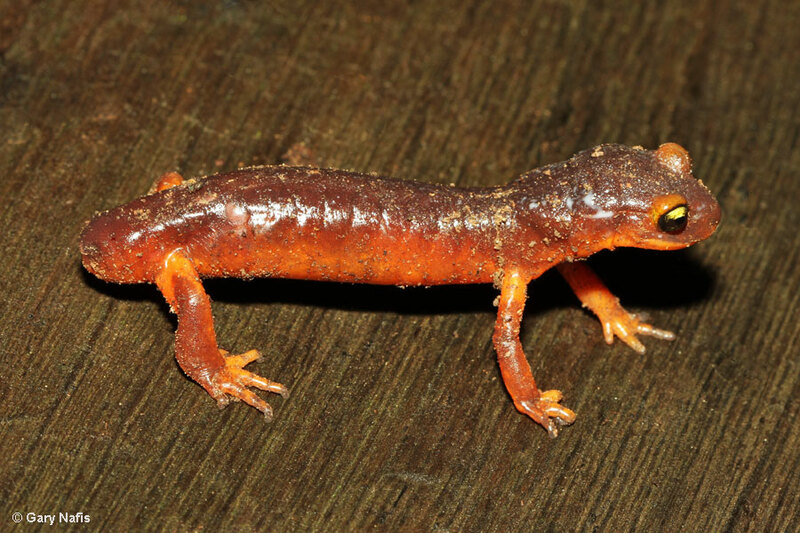 Ensatina is the most widely-distributed plethodontid salamander in the West, ranging from an isolated location in the mountains of Baja California north along the extreme northwest coast of Baja California, through most of California excluding the deserts, the central valley, and high elevations in the mountains, continuing north into Oregon and Washington west of the Cascades Mountains, and farther north into Canada along the coast of southern British Columbia. Also found on Vancouver Island. 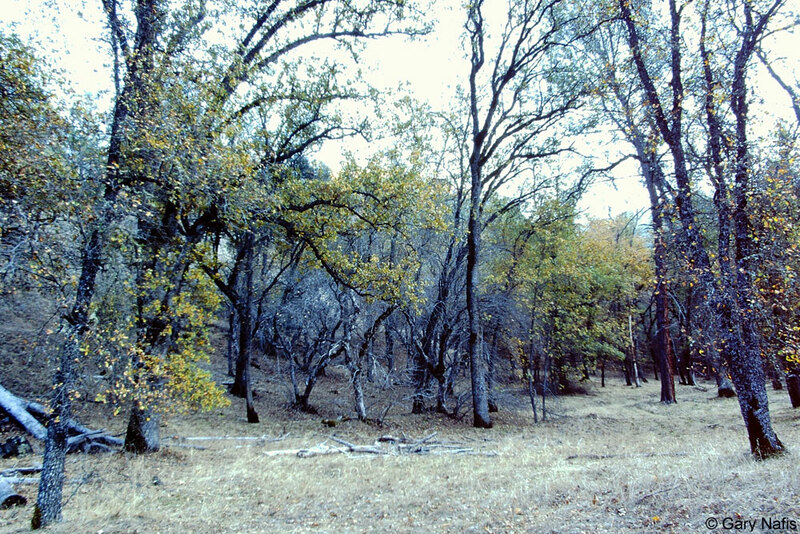 The range maps in Stebbins (2003 and 2012) show a very large range of intergradation between 4 subspecies in Northern California that at one time was considered part of the range E. e. oregonensis. I show this range on my maps as E. e. oregonensis partly because Stebbins & McGinnis, 2012, report that molecular studies have shown complexities that make the use of the term "intergrade" innacurate. 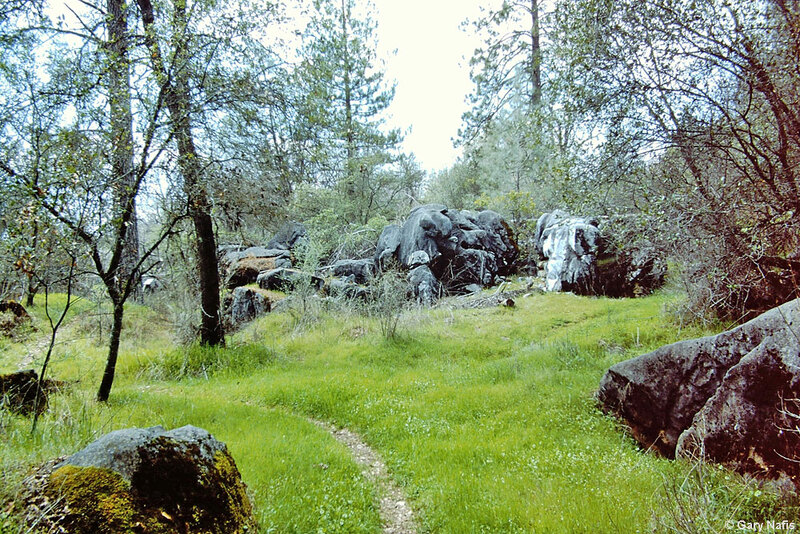 E. e. xanthoptica hybridizes with E. e. platensis in the Sierra Nevada foothills. 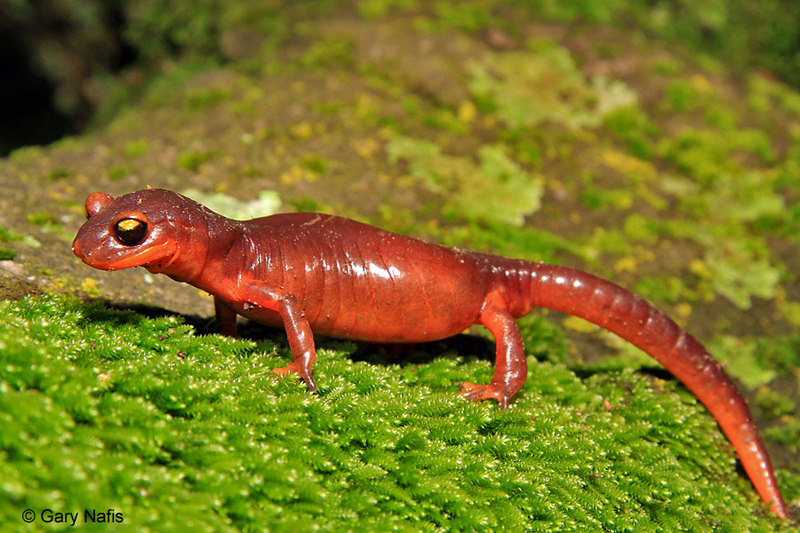 Some researchers see Ensatina eschscholtzii as two or more species that make up a superspecies complex. 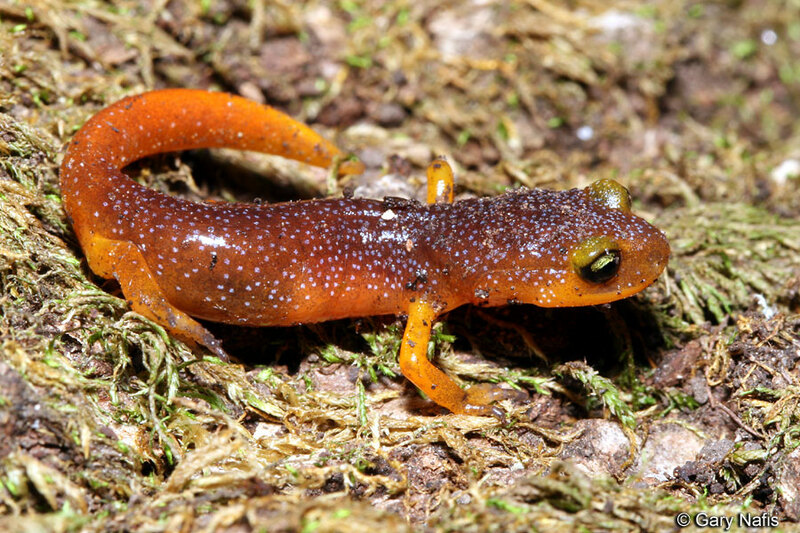 They recognize E. e. klauberi, found at the southern end of the ring, as a separate species - Ensatina klauberi. Ensatina eschscholtzii has been called a "ring" species, or "Rassenkreis" (race circle) "...a connected series of neighbouring populations, each of which can interbreed with closely sited related populations, but for which there exist at least two 'end' populations in the series, which are too distantly related to interbreed, though there is a potential gene flow between each 'linked' population. Such non-breeding, though genetically connected, 'end' populations may co-exist in the same region thus closing a 'ring'." 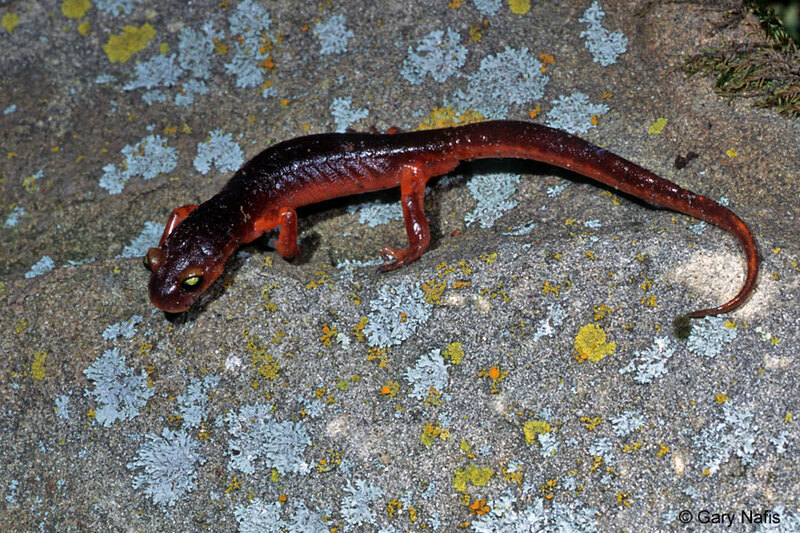 (Wickipedia, 8/26/17) The "end" populations of Ensatina are the E. e. escholtzii and the E. e. klauberi subspecies, which hybridize in San Diego County. 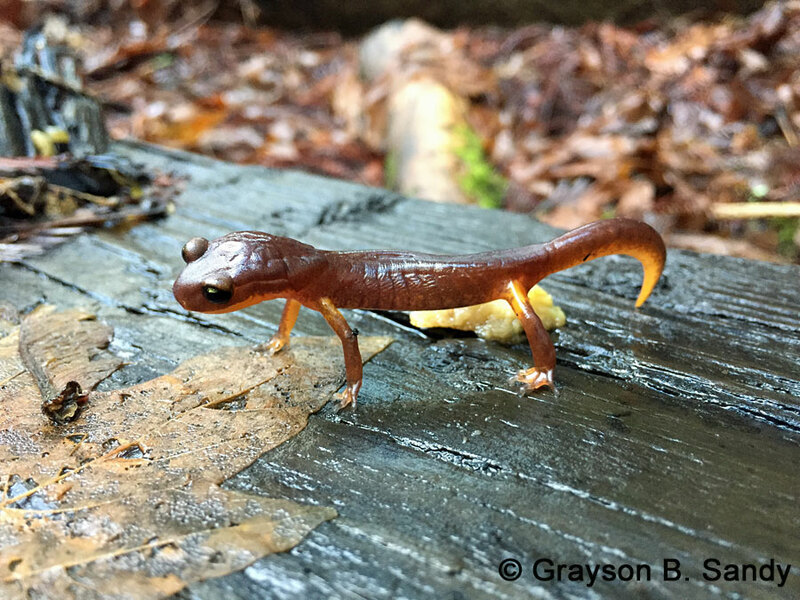 To learn much more about Ensatina and the ring species concept, check out this Understanding Evolution Research Profile about Tom Devitt's work. 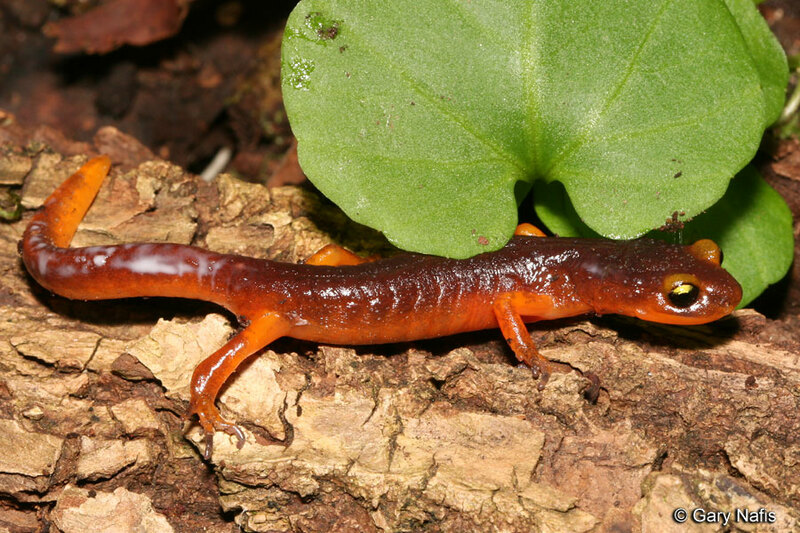 Charles W. Brown explains the taxonomy of the Ensatina complex in detail, describing it as "a classical example of Darwinian evolution by gradualism; an accumulation of micro mutations that is now leading to the formation of a new species." Use: This file is licensed under the Creative Commons Attribution 2.0 Generic license. Photo Credit: Thomas J. Devitt, Stuart J.E. Baird and Craig Moritz, 2011. Source: (2011). 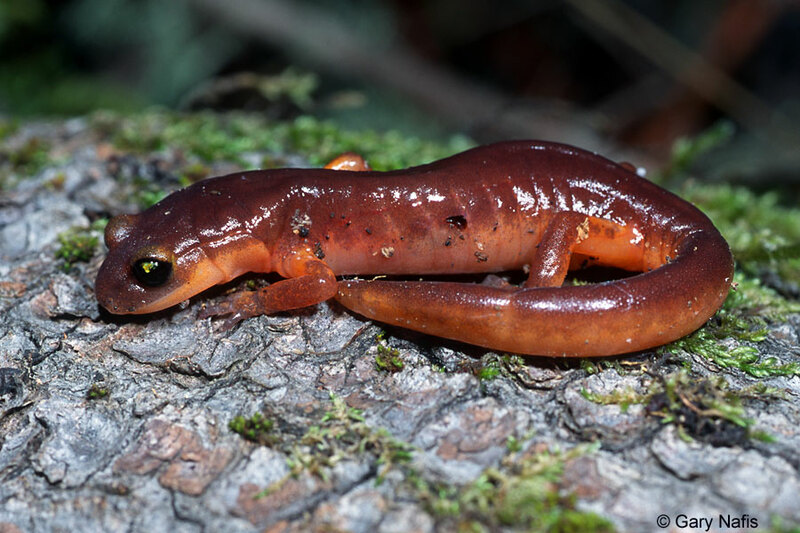 "Asymmetric reproductive isolation between terminal forms of the salamander ring species Ensatina eschscholtzii revealed by fine-scale genetic analysis of a hybrid zone". BMC Evolutionary Biology 11 (1): 245. DOI:10.1186/1471-2148-11-245. 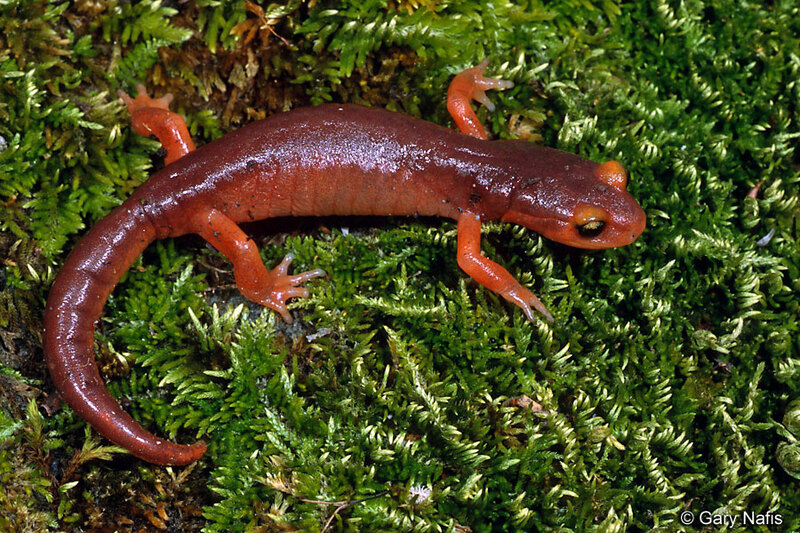 What Subspecies of Ensatina Occurs in San Francisco? The range map in Stebbins, Robert C. Amphibians and Reptiles of Western North America. McGraw-Hill, 1954, shows them to be intergrades, but does not indicate whether they itergrade with E. e. eschscholtzii or with E. e. oregonensis. The range map in Stebbins, Robert C. A Field Guide to Western Amphibians and Reptiles. Houghton Mifflin. 1985. shows them to be intergrades, but does not indicate whether they itergrade with E. e. eschscholtzii or with E. e. oregonensis. The large color range map in Thelander, Carl G., editor in chief. Life on the Edge - A Guide to California's Endangered Natural Resources - Wildlife. Berkeley: Bio Systems Books, 1994. based on two of Stebbins works appears to show them as intergrades with E. e. eschscholtzii but that is not clear either. The range map in Petranka, James W. Salamanders of the United States and Canada. Smithsonian Institution, 1998. shows them to be E. e. oregonensis. The range map in Stebbins, Robert C. A Field Guide to Western Amphibians and Reptiles Third Edition. Houghton Mifflin. 2003. is too small to show that part of the peninsula. The map used by Devitt, et al, 2011, shown above in their illustration of the Ensatina ring, shows them to be E. e. oregonensis. The range map in Stebbins, Robert C., and McGinnis, Samuel M. Field Guide to Amphibians and Reptiles of California: Revised Edition (California Natural History Guides) University of California Press, 2012. shows them to be E. e. xanthoptica. 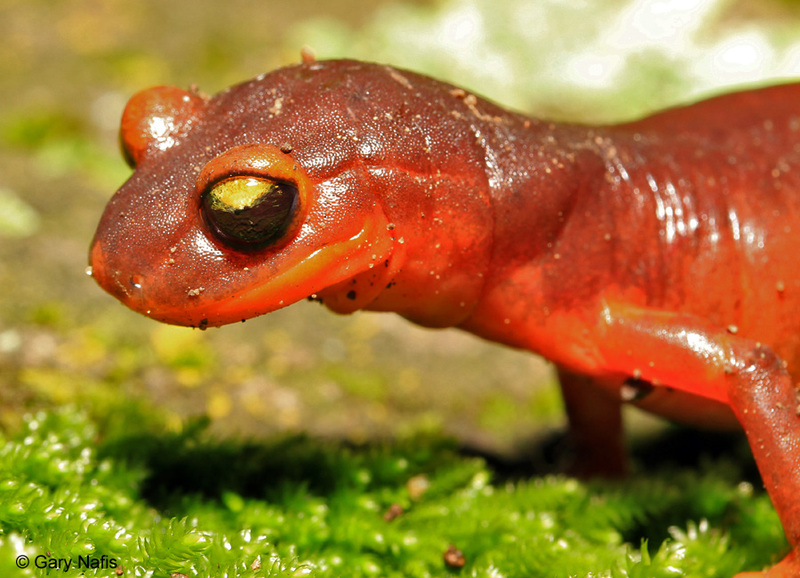 There are certainly more studies with more maps which I have not seen, but since some recent research shows them as E. e. xanthoptica (and photos I've seen of Ensatina from San Francisco corroborate this) I will show them as such until further research shows otherwise. Ensatina: Latin - sword shaped/similar to, possibly referring to the teeth. eschscholtzii: honors Johann F. Eschscholtz. xanthoptica: Greek - yellow eye. Joao Alexandrino, Stuart J. E. Baird, Lucinda Lawson, J. Robert Macey, Craig Moritz, and David B. Wake. Strong Selection Against Hybrids at a Hybrid Zone in the Ensatina Ring Species Complex and Its Evolutionary Implications. Evolution, 59(6), 2005, pp. 1334–1347. 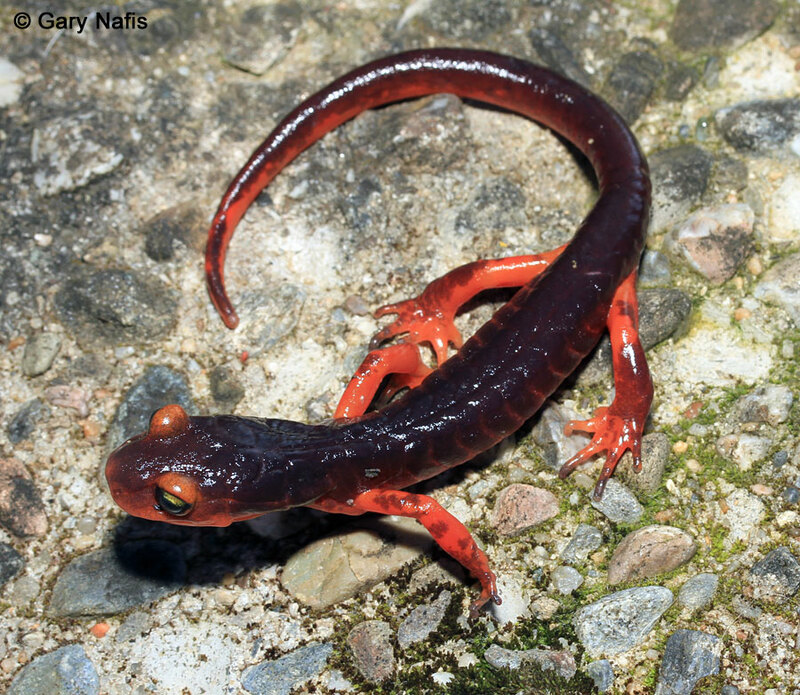 This salamander is not included on the Special Animals List, which indicates that there are no significant conservation concerns for it in California.